As mentioned in my strawberry manicure post yesterday, I'm participating in my first craft fair in years. I hope I don't end up in the red! But because it's a strawberry festival, I'm expecting to see juicy reds like Robin from Tinker Bead Designs found on Etsy. Her red home decor ideas include fiery red sunset photography print by Sue Dickson Gallery, In the Poppy Field fine art print by Vaida Photo and my red gerbera daisy art magnet. I love all the red! It is very beautiful. Have fun at your craft fair. Best of luck at the craft fair! My mom used to do shows and I loved tagging along -there was such a great energy and so many creative people to meet! And beautiful treasury by the way! Red is another favorite especially when it is with black. This week I featured Magenta in my Mondays Reflections. Join us for WW and share yours when its ready! Good look at the craft fair. 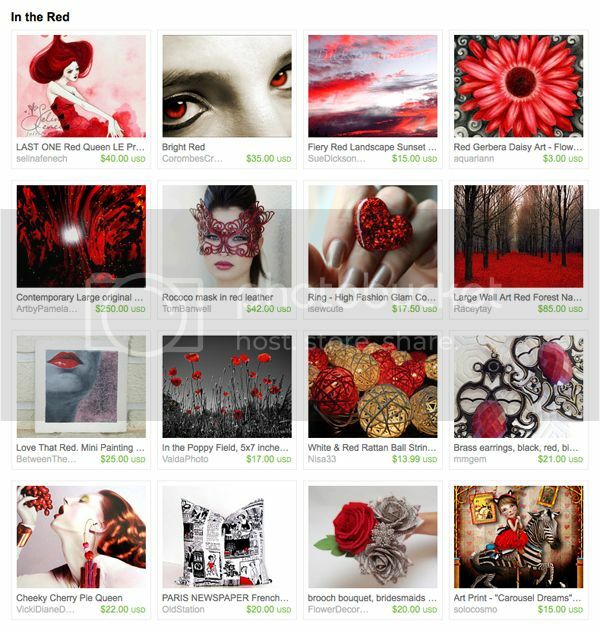 :) Gorgeous treasury, nice to see one full of deep reds. Beautiful reds! And good luck at the Festival! Good luck! Have a great time! I love, love, LOVE the treasury!!! The fiery sunset photo is amazing! Fantastic treasury! I love the color red, so bold and powerful!